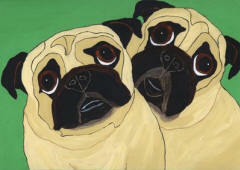 I love painting my Pugs and Dog Pals! Each one brings me new joy and excitement. 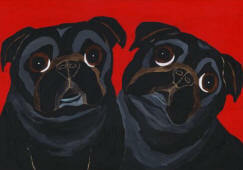 I am often asked how I create my paintings and capture the expressions in my characters. The answer is, I am not exactly sure how I do it, or where the creative energy comes from. I do know that I cannot create one everyday. It is a energy that builds, and I can actually feel a painting coming on. It is a fun and creative process. I am a self taught artist. My passion is working with acrylics on wood. 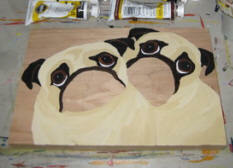 I love how the paint glides across the wood, often revealing a subtle, natural grain of the surface below. I documented stages of the painting process to show you how I do it. I start with a 8 x 10 x 3/4 piece of hemlock wood and sketch my subject in pencil. Then I decide upon the colors I will use, mix my paints, and start painting the head and body. I work on the shading the fur as I go. I often add a bit more detail at the end of the process but most of it is put down in this stage. I then move on to the ears, eyes, muzzle, nose and mouth. 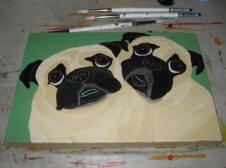 I usually paint in the background before I put in the final touches and wrinkles. Voila! 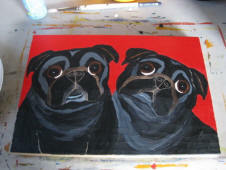 A new Pug or Dog is born in the Dog Art Studio family. 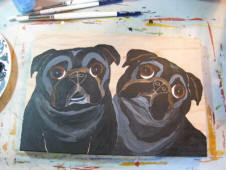 If you enjoyed this demonstration, please click the links and keep reading to learn more about Melissa, Emmitt and the story of how Pug Notes & Dog Art Studio came to be.